Scott developed his interest in the culinary field at a young age while working under George Kramer, CIA trained owner of C & G’s Luncheonette in Toms River, working his way up from dish boy all the way to the top. He paid for his Rutgers University education by working weekends in the restaurant slinging hash browns. His double majors in English and Philosophy allowed him to soon realize his love for cooking. After graduation, Scott wanted something more than his day job, so he went to culinary school at night, at the Institute of Culinary Education in Manhattan, because he wanted to. Rather than following his desk job to another state, Scott and his wife, Maija, boldly endeavored to pursue a different type of food truck. While trying to think of a name for the lunch truck, Scott was driven crazy by his wife who was attempting to turn anything he said into a catchy title. While driving the roads in North Jersey, they came to a fork in the road BING! THAT’S IT! Fork in the Road, LLC, was born! 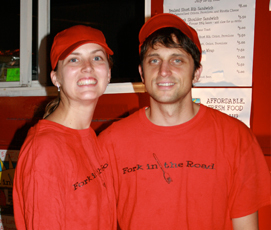 It is our effort to bring affordable, fresh, mobile cuisine to a town near you. Please contact us for any event you have in mind – catering for all types of parties, birthdays, weddings, corporate events, fairs, festivals, and fundraisers. 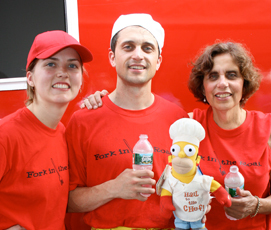 Call us at 732-930-1139 or email us at forkintheroadllc@gmail.com.